Manufacturer of Jar Cleaning Machine. 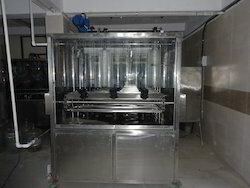 Our product range also comprises of Filling Machine, Laboratory Incubator and Water Plant. We have established ourselves as a renowned manufacturer and service provider of Jar Cleaning Machine. The machines offered by us are fully automatic and reduces labor cost. We offer these machines with external & internal jar washing machines that are best for PET & PC jars. Owing to the attributes. Looking for Jar Cleaning Machine ?